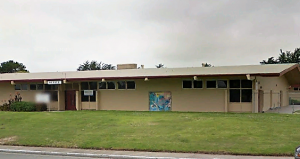 Working with the facilities management team for the Monterey Peninsula Unified School District, the conservation staff at the Water Management District helped to landscape the open space at Martin Luther King Middle School by removing 21,680 of turf and non-native plants. 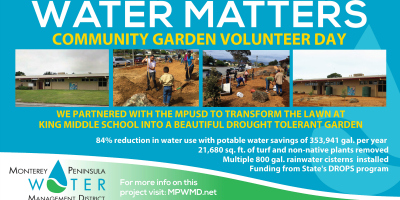 This water intensive growth was replaced with drought-tolerant plants, planters and mulch resulting in an 84% reduction in water use with potable water savings of 353,941 gallons per year! That is over an acre-foot. 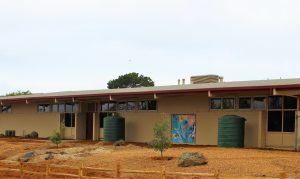 In addition, multiple 800 gallon rainwater cisterns were installed and the project was funded through grants and rebates from the Water Management District and the State’s DROPS Program. 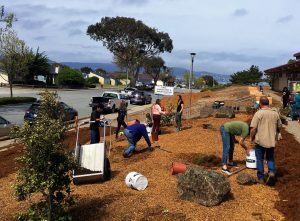 Volunteers from the community and CSUMB’s Return of the Natives Project helped to complete the project.